Sonoma State University sports update, May 4-10. Men's golf knocked out of NCAA Regionals, but one Seawolf goes on to national individual tournament; two Seawolves snag All-Region honors in Softball; baseball, women's golf and women's track & field seasons come to an end. 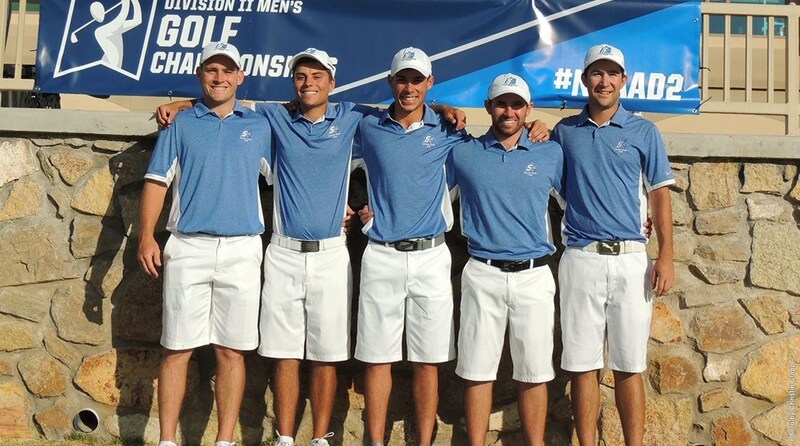 After finishing the opening round in 15th place, the Sonoma State men's golf team jumped all the way up to 5th place during Tuesday's second round before finishing in 8th place out of 20 at this the NCAA Division II West/South Central Regional at University Golf Club in Las Cruces, New Mexico. Senior Brandon Lee will advance to the national championships at Green Valley Ranch Golf Club in Denver, Colorado on May 17-19 after finishing 2nd out of 108 golfers in the regional with a four-under-par 209 (71, 70, 68). Seniors Carlie Daniel and Amanda Llerena have earned All-West Region softball honors. Daniel, who played mostly at third base, hit .326 this season and tied the school record with 18 doubles. She was named to the second team by the Conference Commissioners Association (CCA) and National Fastpitch Coaches Association (NFCA). Llerena, a 20-game winner for the third consecutive year, earned second team CCA honors in a season where she posted a 1.98 ERA with 175 strikeouts in 226.1 innings pitched. The five runs given up in the first four innings proved to be too much to overcome as the Sonoma State softball team suffered a 5-1 loss to fifth-ranked Humboldt State in the opening round of the NCAA Division II West 1 Regional Tournament at the HSU Softball Field in Arcata on May 5. Sonoma State got out to a strong start, plating three runs in the first inning in the NCAA elimination game on May 6, but a mid-inning outburst by Chico State spelled doom as the Seawolves saw their season end with a 9-4 defeat. The Seawolves finish the 2016 season with a 33-24-1 overall record and an eighth consecutive trip to the NCAA Tournament. After ending the first two rounds of the 2016 NCAA Division II Women's Golf Super Region 4 Tournament in 3rd place, the Sonoma State women's golf team struggled on the final day, dropping three spots to finish 6th out of 12 teams at Brookside Country Club in Stockton on May 4. The Seawolves missed qualifying for the NCAA Division II Championships by only six shots, recording a team total of 896 (+32) in the 54-hole event. Sarah Rotter missed qualifying as an individual by just one shot, firing a four-over-par 220. Rotter tied with three other players for 8th place individually after she carded rounds of 71, 72 and 77. An encouraging spring track and field season came to an end on Friday as the Seawolves competed at the 2016 CCAA Track & Field Championships at Jesse Owens Track in Los Angeles. Five Sonoma State student-athletes competed in six different events, with Angelique Lopez doubling up in the 100 and 200. The team's top finisher in Friday's preliminaries was Analicia Garcia, who turned in a 4:51.75 in the 1,500 to earn an alternate spot in the final. The season's final meet closes out a strong season with nearly every student-athlete on the roster earning a new personal record in at least one event. Needing a win and some help from Cal State East Bay to nab the final spot in the CCAA North Division playoffs, the Sonoma State Seawolves got behind early and couldn't come back, ending their season and their playoff hopes with a 5-2 road loss May 8 against the San Francisco State Gators. Sonoma State finished 21-27 overall and 19-18 in the CCAA, good enough for fourth in the North Division behind CSU Monterey Bay, Chico State, and CSU East Bay. Entering the final weekend of the regular season with Cal State East Bay two ahead in the loss column for a spot in the CCAA playoffs, the Sonoma State Seawolves kept their hopes alive after an 11-4 romp over San Francisco State on Friday afternoon that featured a season-best 18 hits. On a day where Sonoma State honored the 16 seniors playing in their final games at Seawolf Diamond, the Seawolves swept their doubleheader with San Francisco State to keep pace with Cal State East Bay going into the final regular season game of 2016. Game 1 - Sonoma State 5, SF State 1. In the opener, the Seawolves got another great start from Cal Becker and rode the hot bats of Daniel Caresio and Tyler Glenn to victory over the Gators. Game 2 - Sonoma State 8, SF State 4. A week after his extra-inning walkoff hit against Stanislaus State, Trevor Abrams turned in his best offensive performance as a Seawolf, highlighted by a line drive grand slam in the third inning that bounced off the top of the left field fence and over for his first home run of the season as the Seawolves completed their doubleheader sweep.